The OS1600, OS1700 and OS1800 series has been discontinued. Please see the OS-MINI series as a possible alternative or contact our Temperature Engineering department. The OS1600, OS1700 and OS1800 Series are a complete family of non-contact infrared two-wire temperature transmitters, with temperature ranges from -45 to 2500°C (-50 to 4500°F). This family provides the ultimate in performance and versatility at an economical price, with two-wire simplicity, a choice of six infrared spectral responses, and a broad range of temperature capabilities. The linear 4-20 mA output signal allows the sensor to be interfaced with a variety of remote devices: indicators, controllers, recorders and/or computers, etc. For fine tuning, the sensors have an adjustable response time of 0.2-5.0 seconds, an emissivity adjustment of 0.1-0.99 and an adjustable peak hold option. Accessories include air purge collar to protect the lens, and a water cooling/air purge unit for high ambient exposure temperatures up to 120°C (250°F). 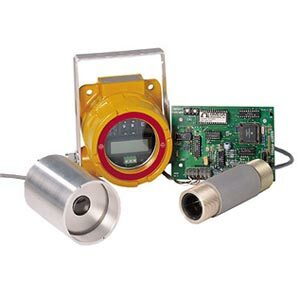 Completely self-contained in a rugged, compact NEMA-4 enclosure, the OS1800 Series sensor offers the additional convenience of a built-in digital display for local on-site readings. The OS1800 Series is supplied complete with OS1800-SB swivel mounting bracket for aligning the sensor (on the back of the unit) to “look” at the surface being measured. The OS1700 Series is completely self-contained in a rugged, compact housing. Combining the electronics with the infrared sensor, the OS1700 is ideal for OEM and multi-unit installations. Mounting accessories for the OS1700 are optional and must be ordered separately (see accessory ordering matrix on page 61). The OS1600 Series rugged sensor combines a miniature sensing head with remote electronics for applications in restricted areas. It is designed for OEM and multi-unit applications where cost and space are limiting factors. The OS1600 Series comes complete with infrared sensing head, 10' of interconnecting cable, electronics board, OS1600-2LN mounting lock nuts, OS1600-MB mounting base and complete operator’s manual. *Specify temperature range code from Temperature Range Table. **Specify focal option from Focal Option Table.